Through its Catch and Release policy, the Department of Homeland Security (DHS) has since December released 84,500 immigrants who crossed through the U.S.-Mexico border, Immigration and Customs Enforcement (ICE) data show. Catch and Release is in “overdrive,” according to the National Immigration and Customs Enforcement Council, the ICE union. If the current rate continues, DHS will have released half a million immigrants into the U.S. by the end of 2019. At the current rate, DHS is releasing more than 42,000 border crossers and illegal immigrants into the country about every month. If that rate continues, by the end of 2019 DHS will have released more than half a million border crossers and illegal immigrants into the U.S. Under the Catch and Release policy, immigration officials use buses to take immigrants to nearby border cities and drop them off with the promise that they will show up for their immigration and asylum hearings, sometimes years later. Most never show up. Of the 84,500 released since December, 37,500 were dropped off in San Antonio, 24,000 in El Paso, Texas, 14,500 in Phoenix, and 8,500 in San Diego. The overwhelming majority are never deported. 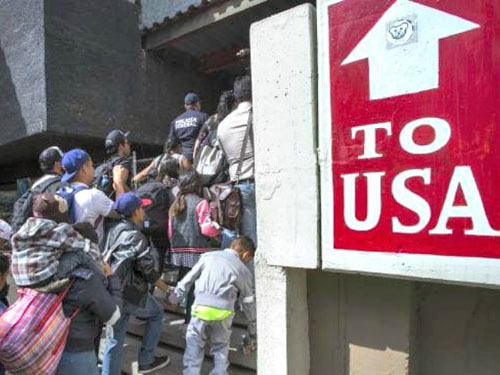 Princeton Policy Advisors researcher Steven Kopits projects that in 2019 there will be an additional 260,000 to 500,000 illegal immigrants who successfully cross the southern border into the U.S. undetected by Border Patrol agents.